Product prices and availability are accurate as of 2019-04-01 12:20:23 EDT and are subject to change. Any price and availability information displayed on http://www.amazon.com/ at the time of purchase will apply to the purchase of this product. 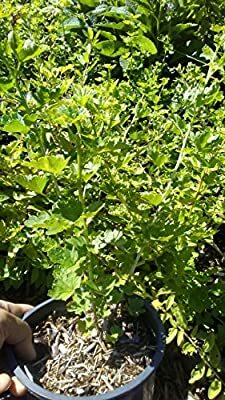 These plants are healthy 1 year old Black Velvet gooseberry plants. I shake off the loose soil for shipping and ship in USPS Flat rate padded envelopes. If you order after mid October the plants will have gone dormant and lost all of their leaves. Just plant them when received, make sure they get some water and wait until spring. These plants have thorns which make them deer resistant and a good hedge that people wont want to cross. The berries are large and dark purple with a very good flavor. AmericanGardener is a participant in the Amazon Services LLC Associates Program, an affiliate advertising program designed to provide a means for sites to earn advertising fees by advertising and linking to Amazon.com, Endless.com, MYHABIT.com, SmallParts.com, or AmazonWireless.com. Amazon, the Amazon logo, AmazonSupply, and the AmazonSupply logo are trademarks of Amazon.com, Inc. or its affiliates.